I’ve been wearing Simms Guide waders since at least 1998. They were, are, and will almost certainly remain the absolute best waders on the market. Of course, they’re also expensive — over $500 these days. There’s no question you get value for that money; on average, I get about 4-5 years of very heavy use out of Simms Guide waders, compared to a max of three seasons from most competing brands. Waders of this quality also change the way you fish, because they give you the confidence to go places you otherwise wouldn’t dare. In that sense, they’re a lot like having knee-high snake boots during turkey season–they make you better because they get you where the better quality game actually lives. This year’s iteration of the Guides is, naturally, the best ever. Simms has a longstanding program of testing its equipment out on actual working Joes (including people in the Bozeman-area construction industry). They intentionally invite a process that ends up working a lot like natural selection, to weed out the things that don’t work. 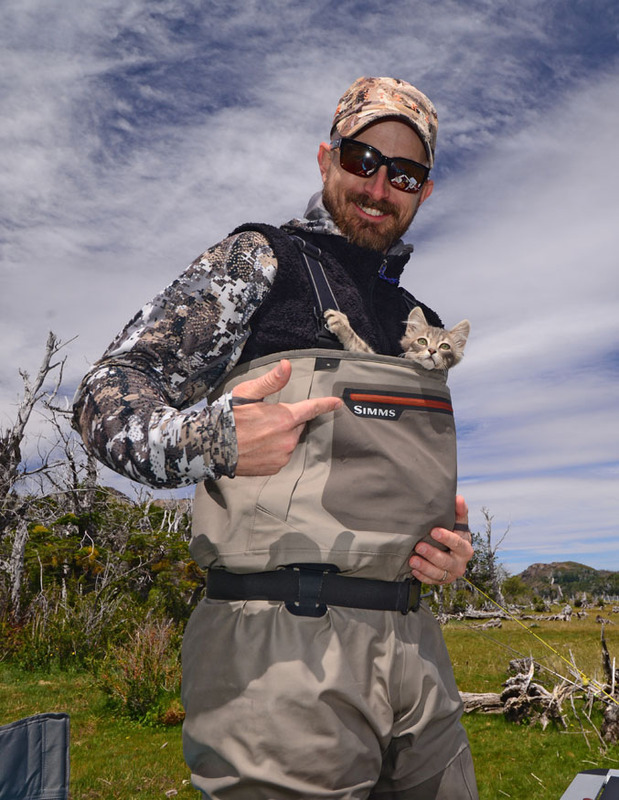 On the Men’s version of the Guides, the 2016 models feature a handwarmer pocket with flaps to keep spray out, a zip-out inner chest pocket (which I immediately made use of by tossing the pocket in a bag), wader strap retainers, upgraded gravel guards which are finally hitting something like real durability, and a vertical seam below the knee which has been doubled back for even stronger protection. All of this has evolved organically year-by-year (I can recall when the knee seam was switched to the front to reduce wear and tear from walking). Plus they all come with a free kitten! Meanwhile, classic Guide features like the excellent back strap system, the interlocking strap connectors (so you can convert to waist-high use), and the exploded microfiber face fabric remain, as they have for more than a decade now. Simms has added a couple color elements over the years–including a ribbon at the top of the bib and a subtle color change below the knee, but these waders wear and feel like they always have, just with slightly more convenient touches. 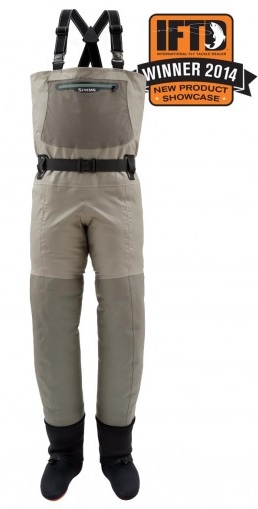 Bottom line, Simms has slowly but surely just about perfected the heavy duty fishing wader. Gore-tex, which Simms employs exclusively on its top-end products, employs a microporous membrane which is sliced with a frickin’ laser beam for absolute consistency in terms of thickness, and as a result it is approximately 40% more breathable on average when compared to microporous membrane fabrics made by non-Gore competitors like Toray and Dupont using something called the “knife over technique.” Think of the difference between a slice of American cheese on a sandwich, all perfectly consistent, when compared with cream cheese smeared on a bagel. If your water vapor has to penetrate that “cheese” (the PTFE microporous membrane layer), you want it to be perfectly flat and narrow (like Gore-tex) as opposed to having a variety of thicker peaks and valleys (like the competitors). Bottom line, Gore-tex really is the best breathable material available, still today. The Ladies’ version of the G3 Guides was an especially nice surprise, as Simms has effectively ditched every frou-frou aspect of female product design with the exception of a single teal color band (instead of orange), which actually helps tell the waders apart when they’re hanging from a hook with a bunch of other anglers’ identical waders. The Ladies version lacks the pocket flaps on the edges of the handwarmer pocket, likely to cut down on bulk, and has a slightly different seam construction in the hips, but has exactly the same finishing touches in all other respects. It is, in sum, a perfect equivalent to the Men’s version with no corners cut. In a sense this is a compliment to female anglers, because it recognizes that what ALL anglers really want is not fashionable accoutrements and floral patterns, but just GOOD GEAR. The bottom line is that the Simms G3 guides remain the workhorse of the industry. If you really just want to get the waders that will serve you the longest with the most comfort for the most reasonable price-to-quality, look no further. Yes, they are expensive, but if you plan to live your life on the water, they make all the difference.